What company manufactures the glass mosaic tile backsplash? This kitchen is amazing! Love! Unfortunately Step in Stone does not sell small samples. You have to pay $50 for one large sheet to get a sample. I called them to ask about this tile. Where can I learn more about the retro range? These are Northstar brand appliances, made by Elmira Stoveworks in Elmira, Ontario. Who makes the rangehood? - Who makes the rangehood? Like the look we were limited in Australia to just SMEG appliances. I would of preferred the north star. I like the red doors. Where can the turquoise tumbled-glass backsplash be purchased from? - I would love to find the vendor!! Does any store on the West Coast carry this backsplash? What company makes the tile? Where did you get the microwave? That is really really cool! i'd love to find one in red? Hi, where is the tile sourced from? Thanks! What brand are the appliances? These are from Elmira Stove Works but Big Chill makes retro appliances too! Love the paint color on the walls….what is it? Thanks in advance! Yes, what is the paint color? It is so cute! sorry I do not have a record of this selection. What is the counter top made of and where did it come from? Yes, please give us the info on the countertop! Clean and doesn't distract from other focus items. Beautiful! What was the source of the cabinet hardware? Thanks! 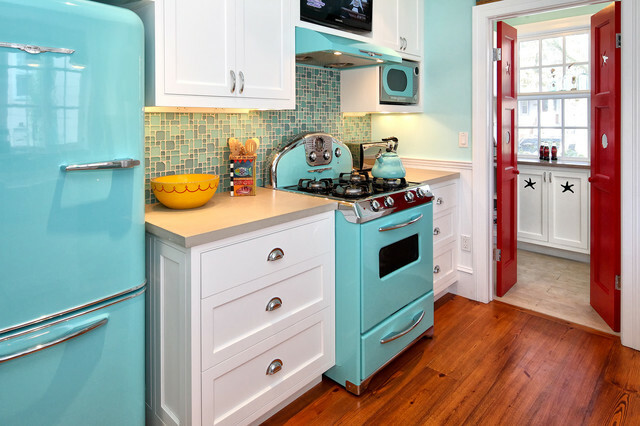 These vintage-inspired turquoise numbers from Elmira Appliances give this kitchen a fun retro vibe without going overboard into Mrs. Cleaver land. Glen advises keeping your appliances in proportion with one another. A 48-inch refrigerator might end up overwhelming a 30-inch range. Having a massive refrigerator that sticks out beyond your counters won't just interrupt your traffic space; it's unsightly too. Alper also suggests looking into undercounter appliances. While they're often more expensive because they need to be built in, they help minimize counter clutter and can be easily accessed. Countertops often work well for appliances not used every day and that can be stored away most of the time. 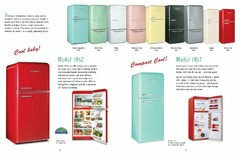 Retro source: Elmira Stoveworks is a great resource for retro appliances, including the fridge and stove shown here. 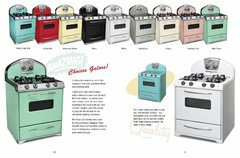 Its Retro Northstar collection has the classic curves and fun colors of vintage 1950s appliances. 9. Give the appliances some elbow grease. Buyers want stoves that shine, not evidence of last week’s tuna casserole. Clean the oven, refrigerator, microwave, sink and any other appliance that will be included in the purchase of the home. Estimated costs: Most cleaning products start at $4; elbow grease is free. I kind of like that they put a tv up on top of the hood.